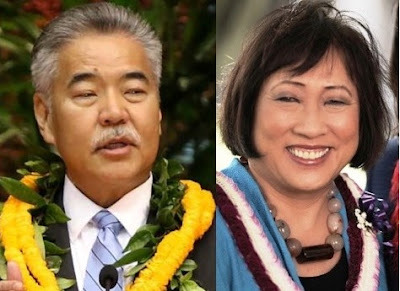 Ige, Hanabusa spar over alleged conflicts as primary race heats up. Gov. David Ige is ratcheting up his election-year criticism of U.S. Rep. Colleen Hanabusa by reviving the issue of her two-year push for a huge state tax credit for development of an aquarium at Ko Olina, alleging the deal demonstrates that she makes decisions “on behalf of self-interest and special interests.” Star-Advertiser. House finance leader apologizes for attack on Ige. House Finance Chairwoman Sylvia Luke apologized on the House floor Friday for comments she made in a Honolulu Star-Advertiser story April 15 in which she described Gov. David Ige as “almost like this desperate caged animal.” Star-Advertiser. For Hawaii Politicians, It Pays To Have Jennifer Sabas On Your Side. Support from the former top aide to the late Sen. Daniel Inouye has been a boon to two prominent candidates in their bids for higher office. Civil Beat. Tupola seeks restraining order against activist. Republican candidate for governor state Rep. Andria Tupola has filed for a temporary restraining order against the leader of a Republican splinter group, alleging she has been harassed and cyberbullied. Star-Advertiser. House, Senate Agree To $14 Billion State Budget Bill. A joint conference committee passed the overall budget bill ahead of schedule to fast-track funding for areas hit by flooding. Civil Beat. House and Senate conferees on Friday approved a final version of the state budget bill, which includes operating and capital improvement monies to run the state government. West Hawaii Today. Hawaii Businesses Are Making Billions Off The Military. Hawaii is second only to Virginia in the amount of money that flows into the state through Defense Department spending. Civil Beat. Hawaii Attorney General Russell Suzuki on Thursday said the state received more than $84.7 million as part of its arbitration settlement with the tobacco industry. Pacific Business News. Report says Hawaii can reach renewable energy goal faster, and cheaper. A report released by the Honolulu-based Elemental Excelerator on Friday said Hawaii can achieve 84 percent of its clean energy goal by 2030, more than double the state’s target for that year, and that it would be cheaper than not doing anything. Pacific Business News. Hawaiian Electric reduces annual oil usage by more than 2M barrels over seven years. Hawaiian Electric Cos. on Thursday released its 11th annual Sustainability Report for 2017-2018 describing the utility's efforts to address climate change and contribute to community sustainability. Pacific Business News. Honolulu-based ocean cargo transportation firm Matson Inc. said in an annual report that its charitable giving rose 28 percent to $3.7 million last year from $2.9 million the year before. Star-Advertiser. Lack of officers is hurting operation of HPD, chief says. Honolulu Police Chief Susan Ballard last week gave the City Council a rough but far-ranging outline of her priorities for the department, including plans to increase HPD’s ranks significantly and create a larger yet friendlier presence in the community. Star-Advertiser. Public comment on the Honolulu Police Department is being sought Tuesday as part of an on-site reaccreditation assessment being conducted by the Commission on Accreditation for Law Enforcement Agencies Inc. Star-Advertiser. The city is opening two disaster recovery centers on Oahu to help flood victims get help. Hawaii News Now. East Oahu residents still picking up the pieces after damaging floods. Hawaii News Now. Public beach access at Kahala Resort debated. Kahala Hotel &Resort, which holds a state-issued revocable permit to use its public beachfront for private purposes, promised area residents and beachgoers last year it would widen and improve an existing path to delineate public and private spaces. Star-Advertiser. Tenant ‘farmer’ ran junkyard, says property owner stuck with fines nearing $1 million. Star-Advertiser. The Hawaii Elementary and Middle School Administrators Association announced on Sunday that Linell Dilwith of Stevenson Middle School is the 2018 Hawaii National Distinguished Principal. Hawaii News Now. From 'trash' tree to treasure. Albizia: arguably Hawaii’s most maligned invasive plant species, a real threat to life, property and Hawaii’s native forests. Star-Advertiser. Council committee to hear vacation rental bill. West Hawaii Today. Airbnb hits record Merrie Monarch high. West Hawaii Today. Software problems hold up building permits. Hawaii County has not been accepting new building permit applications since Monday due to a software snafu. Tribune-Herald. Thirteen families living on Mauna Ziona Church property in North Kona are likely to be evicted in the coming weeks, more than two years after the property was purchased at county tax auction by the Free Church of Tonga-Kona. West Hawaii Today. State House blocks bills against Thirty Meter Telescope. A bill that would impose a construction freeze atop Mauna Kea and potentially thwart development of the Thirty Meter Telescope appears to have been dealt a fatal blow. Star-Advertiser. The long-delayed opening of new ball fields in Hilo is being set back indefinitely after an engineering report identified drainage problems. Tribune-Herald. Aviation noise to persist over Puna. Puna residents hoping for regulation of helicopter tours headed to Hawaii Volcanoes National Park will have to settle for resolutions instead. Tribune-Herald. The state Legislature announced Friday that a $300,000 allocation will be made in the state budget to fund rat lungworm disease research at the University of Hawaii at Hilo. Tribune-Herald. A faulty decision by a state commission over Hawaii land use looks like it will cost the state as little as $1 instead of a previously agreed-to $1 million. Star-Advertiser. Attorneys for South Kohala developer Bridge Aina Lea LLC are seeking hundreds of thousands of dollars for their work after recently prevailing over the state in a federal takings claim case. West Hawaii Today. Council seeks ‘pause’ on bridge project. Approved resolution can only urge delay of process, still putting federal funding at risk. Maui News. Maui County Council Budget and Finance Committee Chairman Riki Hokama said Friday that he would not include a tiered scheme for property taxes in his proposed version of the budget because the county’s real property tax system is not yet equipped to handle it. Maui News. Maui benefits from completion of House-Senate budget dealings. Maui News. The newly completed Honoapiilani Highway realignment Phase IB-2 opens to traffic today, Monday, April 23, 2018 following a blessing held last week. Maui Now. Maui’s Business Challenges. Maui business leaders say they face the same conditions as Oahu— only more so. Hawaii Public Radio. Kauai County announced Sunday that it is working with the Department of Education to open satellite classrooms for students cut off from the rest of the island by landslides on the island’s north shore following the devastating storm earlier this month. Star-Advertiser. Haena, Wainiha promised school, gas, trash service. Hundreds of people attended a community meeting at Opakapaka Bar and Grill Sunday to hear from county and state officials about resources available for Wainiha and Haena residents cut off after last weekend’s onslaught of torrential rains and flooding. Garden Island. Hanalei Elementary to reopen as flood-damaged Kauai dries out. Hawaii News Now. Damage from recent flooding and landslides has made some tourists wary about vacationing on the Garden Isle. Garden Island. Kauai to set up makeshift classroom, fuel rations in recovery efforts. Hawaii News Now. Kauai mayor provides answers for transportation, sanitation challenges. KHON2. Over 400 people attend community meeting in Wainiha. Mayor Bernard Carvalho Jr., and county and state officials held a community meeting at the Hanalei Colony Resort for the isolated Wainiha and Haena residents. KITV. Several hundred people of all ages gathered at the site of the Kealia Farms farmers market Sunday to caravan up to help the farmers and tenants of the Kealia Valley dig out following last weekend’s record-breaking rains. Garden Island. Rep. Tulsi Gabbard was on Kauai from Thursday through Saturday to assist with recovery efforts after a record-setting storm wiped out many homes and local businesses, left communities isolated due to landslides, and required hundreds to be evacuated. KITV. Lawmakers Question Whether State Should Buy Kauai Farmland. A bill would provide $6 million to the Hawaii Agribusiness Development Corp. to acquire the land, part of which is already leased to a seed company. Civil Beat. Sixty people attend meeting to discuss Lawai Kai Beach access. Garden Island.